Dutch Bikes, Walmart welcomes you to America!! 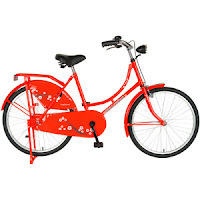 Cruise through city roads with the Hollandia City Leopard 28" Bicycle. 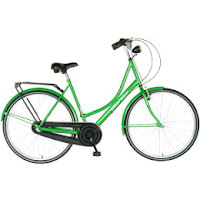 It features a high tensile steel frame that is durable and adds to the bike's stability. The stylish handlebars feature ergonomic grips and facilitate an upright riding style. 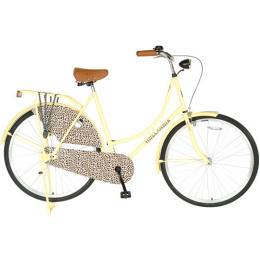 This yellow cruiser bike has cushioned spring saddle seats that are very comfortable. It also has steel brake levers with front caliper and rear coaster brakes that function smooth and make drives safer. Special features in this women's cruiser bike include a headlight that aids night driving and Dutch-style racks for added functionality. Hollandia offers the authentic Amsterdam experience, for those who think the journey is half the fun. If anyone sees this in stores I am genuinely curious as to how horrible this compares to a real Dutch bike. It seems to not have a dynamo at all but runs on batteries for lights. No O-lock either. But you can't beat that price for a starter. Looks like it'll rust in the rain in an hour but they couldn't keep the weight down. They weigh as much as the Gazelle. Apparently Bike Portland reported on this last year and they are Chinese manufactured.